Welcome to my review of the Bushnell Legend Ultra HD 15–45×60 Spotting Scope. Bushnell makes some fine products, but they also produce a few lemons. This always makes me hesitant to recommend Bushnell products until I’ve actually used them, so here’s what I think about the Legend Ultra HD spotting scope. This model features a 60mm objective lens, which will typically allow for pretty decent light gathering in a scope. The overall length of the glass is 11.1 inches, and it weighs a mere 2.5 pounds, making it one of the lightest spotting scopes I’ve used. The problem with the specifications of this spotting scope lies in the eye relief. While Bushnell advertises a single figure of 20mm of eye relief, that’s not entirely accurate. In fact, eye relief when you are fully zoomed in on your subject is more like 14mm, which is a bit too short for those who wear eyeglasses. What Comes Along In the Box? The carrying case is padded and well constructed, and the tripod is amazingly good quality. It’s not a professional-grade tripod, but it’s definitely much better than most included accessories that I’ve come across. What’s the Magnification of the Bushnell Legend Ultra HD 15–45×60 Spotting Scope? This model allows for variable magnification from 15X to 45X, and you will notice excellent image quality and resolution throughout the entire range. 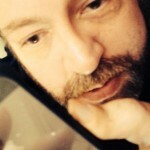 Color reproduction is fantastic, without a hint of chromatic aberration at any magnification. If you plan on spotting bullet holes from beyond 150 yards, you should know that 45X magnification isn’t quite powerful enough to make out the holes unless you are using splatter targets. The optic’s field of view is 140 feet from 1,000 yards at 15X magnification, and 63 feet at 45X power. I’ve seen wider fields of view, but I’ve also seen scopes with much narrower views. Call this one about average. How Easy is the Optic to Use? Magnification and focus controls are exactly where you’d expect them to be. The power selector wheel is on the eyepiece, and the dual focus controls are a stacked knob in the center of the housing. Focusing the glass is easy, with the knob spinning smoothly but with just enough resistance to prevent bumping it. The magnification wheel, though, is much too stiff and may prove problematic for anyone with arthritis or otherwise weak fingers. It is also difficult to move the wheel if your hands are slippery or you’re wearing gloves. Light transmittance is pretty good, providing you with an excellent, bright image even in low-light conditions. 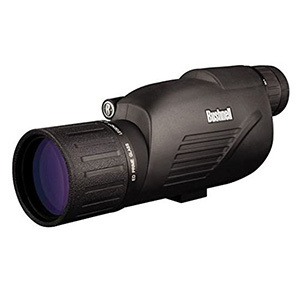 The Bushnell Legend Ultra HD is great for birdwatching, target shooting, or even basic astronomy. This is owing to the fully multicoated optics. This model incorporates BaK–4 prism glass into a porro prism design, with the aforementioned fully multicoated optics. The scope utilizes a straight eyepiece design, with no option to choose an angled eyepiece instead. The lenses are made using extra-low dispersion glass, greatly improving the image quality. In addition, Bushnell has applied its RainGuard HD coating to the optics, allowing for better clarity in wet weather. The image quality is outstanding, with plenty of clarity, contrast, and resolution. There is no noticeable phase shift, pointing to the appropriate application of phase correction coating to the prisms. The stacked dual focus controls allow for a razor sharp image at any magnification, which makes the glass very nice for use at long ranges. Being able to rapidly adjust the coarse focus to get the target clear before fine-tuning your sharpness is crucial to achieving the razor sharp image that birders and target shooters alike need to make the most of their spotting scope investment. The body on the Legend Ultra HD is plastic, with enough texture and ridges to provide you with a positive grip on the glass even with slippery hands or gloves. Unfortunately, plastic doesn’t tend to provide much in the way of shock absorption. This model is both fogproof and waterproof, since the lenses are O-ring sealed and the optics chamber is nitrogen-purged. However, as previously mentioned, the housing doesn’t offer much in the way of shock absorption, so I would recommend being extremely cautious not to drop the scope. The tripod mount works with any standard tripod, but it is not adjustable for different viewing angles.